In 2019, FLOS USA introduces a limited-edition matte-black version of the global design icon, Toio designed by Achille and Pier Giacomo Castiglioni for FLOS in 1962. Toio’s steel base is rendered in a dark embossed finish and the visible transformer is also painted black in a special global run of 2,500 pieces. The matte-black design is available along with the lamp’s signature glossy black and red finishes. The 1962 Toio light surprises with its unexpected design. 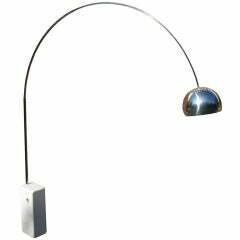 Italian duo Achille and Pier Giacomo Castiglioni had a 300-watt car headlight shipped from the United States, which they joined with parts of a fishing rod to form a functional floor lamp. One of the duo’s experiments with readymade objects, Toio has become a design classic thanks to its surprising material juxtaposition and striking industrial appearance. The fixture’s form is composed of a nickel-plated brass hexagonal stem that uses fishing rod rings to guide the electrical cord from the bulb to the transformer. A cleat on the base, similar to those found on ships, keeps the cord neatly coiled when the lamp’s height is adjusted. Inspiration: Ingenious inventors Achille and Pier Giacomo Castiglioni affixed a car headlight to parts of a fishing rod to form Toio, a playful floor lamp named after the word “toy.” This item is exclusively offered through 1stdibs and FLOS and is only available in the United States and Canada. 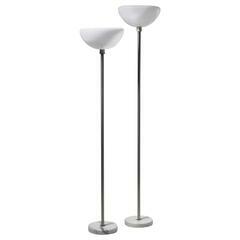 Classic Arco Lamp with carrera marble base and steel arc with perforated chrome lamp head (12" diam) by Castiglione for Flos.